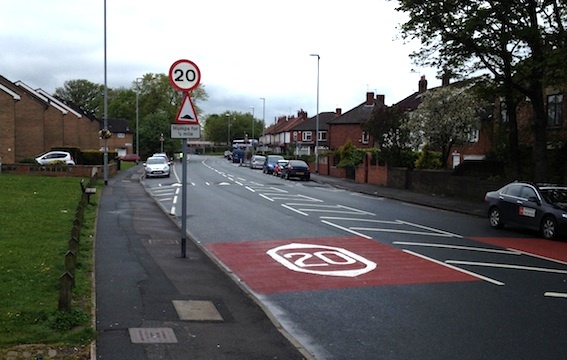 Drivers will be urged to be a “two zero hero” as lower speed limits are introduced in more residential areas across Leeds as part of a city-wide programme to reduce road casualties. The latest phase of Leeds City Council’s 20 miles per hour (mph) speed limit programme will be rolled out from autumn 2018 and will see reduced speed limits introduced in more residential areas where they are not already in place. Existing 20 mph speed limits and zones have already seen significant improvements in road safety in many of the city’s residential areas, with up to 50% drop in road injuries. The new 20mph zones also aim to make walking and cycling more attractive options, leading to less traffic congestion, better health, less noise, more social interaction and stronger communities. The programme will see 20 mph road markings and large traffic signs installed at the junctions where the speed limit changes. Smaller ‘20’ repeater signs will be placed at regular intervals on either side of the road throughout the area of the 20mph limit. Information sessions will be held in community hubs located in the affected areas, and leaflet distribution will take place where 20mph zones will be implemented. A support package for local schools will also be delivered by the Influencing Travel Behaviour team. In addition, larger scale publicity, such as radio and bus back advertising will be used to help with the transition. Work on the schemes will begin in autumn 2018 to allow the early completion of the ongoing 20mph programme within the 2018/19 financial year. I believe the strategy is to make side roads in residential areas 20mph, but leave more major roads such as Old Lane as 30 mph.